David McCrae has been a family friend for over 40 years and in all that time he has studied to increase his considerable knowledge of Edinburgh & Scotland. 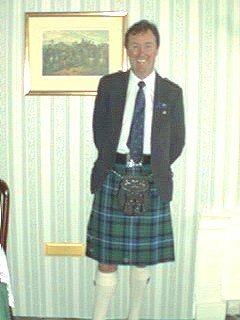 He has been a certified Scottish Tourist Board guide for a number of years and is a regular on many firms books as an entertaining & knowledgeable guide. He can provide everything from a walking tour of the Royal Mile, a chauffeured ride round Holyrood Park, Craigmillar Castle, the Old Town & the New Town,or a day trip to the borders or the highlands. The choice is yours. You can email David at the Sherwood regarding dates etc & we will be happy to pass on the request to David and email you back your requested information or you can phone or fax him personally on +44 131 556 1757. If you want a tour without the crowds or hassle get in touch with David McCrae. Prices are negotiable . If driven tour required petrol prices are additional to normal rates.